Last night, the United Nations Volunteers (UNV) programme brought the achievements, commitment and energy of five young volunteers into the international spotlight through a unique partnership with MBC Hope, the corporate social responsibility arm of Middle-East broadcasting giant MBC Group. The UNV/MBC Al Amal Youth Volunteering Award highlights the capacity of young volunteers in the Arab region to drive positive change in their communities. Moreover, it provides a platform for young people themselves to inspire each other and feel confident about their future. The award recognizes the achievements of five exceptional young people who, as volunteers, have brought transformational change to their communities. These 18-29 year-olds from Egypt, Jordan, Morocco Tunisia and Yemen are role models for their peers, and their achievements exemplify the innovation, commitment, and tireless energy of youth, which are indispensable for development.  Zina El Nahel (Egypt): for her role in providing education to marginalized children in areas with poor infrastructure.  Hadeel AbuSoufeh (Jordan): for her role in supporting social projects to improve lives of students with special needs.  Amal Al Saqal (Yemen): for her role in stimulating the role of students in volunteer work and community building.  Lamia Bazir (Morocco): for empowering women and the supporting their leadership in society.  Saifeddin Jlassi (Tunisia): for his role in the rehabilitation of young refugees through arts and drama. What makes their stories all the more remarkable is that most of these volunteers had to overcome tremendous obstacles in order bring about change. Last year, a call for submissions was undertaken by UNV in five target countries: Egypt, Jordan, Morocco, Tunisia and Yemen as part of its groundbreaking Arab Youth Volunteering for a Better Future project, for young people to share the story of how they, as volunteers, brought transformational change to their communities. Of these, three outstanding young volunteers per country were identified by a national selection committee and awarded during International Youth Day 2014. A second phase followed, where a regional panel of judges comprising the Secretary-Generals Envoy on Youth, the UNV Executive Coordinator, representatives of the German Federal Ministry for Economic Cooperation and Development (BMZ) and MBC Hope, and a youth leader narrowed the selection further. The panel identified a single volunteer per country whose initiative, innovation, and tireless energy has brought profound and lasting positive change to the lives of others. 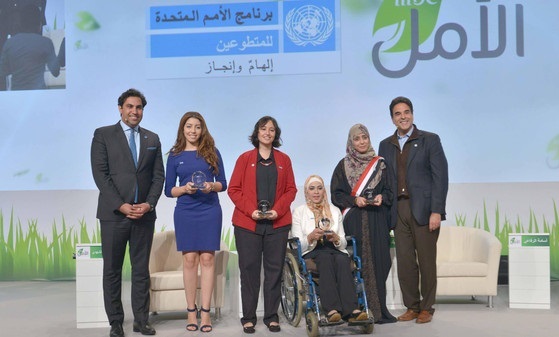 Although only these five volunteers could be celebrated at the UNV/MBC Hope Arab Youth Volunteering Award celebrated, UNV recognizes the tremendous achievements of the other entrants, and hopes that they will continue to inspire others through their volunteerism. Arab Youth Volunteering Future, which is supported by BMZ, is part of the UN Youth Volunteers Programme, a strategic priority of UNV which seeks to facilitate the engagement of youth in global peace and sustainable human development through volunteerism, bringing the voice of youth into the development discourse and helping young people t realize their full social, economic and human potential.